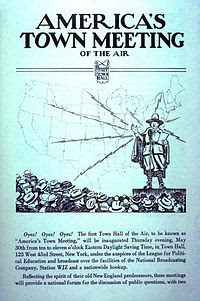 I am searching for the May 30, 1935 program in the series "America's Town Meeting of the Air". That episode was titled "Which Way America: Fascism, Communism, Socialism or Democracy?" A recording of this broadcast existed as late as 1971, as I have an excerpt on an aircheck of a rebroadcast on KRAB-FM, Seattle (now defunct) Oct of 1971. I would like to find a the complete program. Any suggestions as to where a copy could be found or obtained? Thank you.